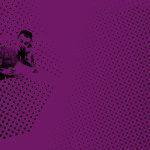 This paper describes the definition of micropitting, the actual calculation method, and its application to practical examples if and where micropitting has occurred. 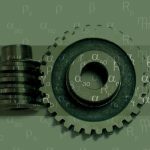 The examples give evidence that the Technical Report reliably predicts the risk of micropitting where it is later found on the gear flanks. 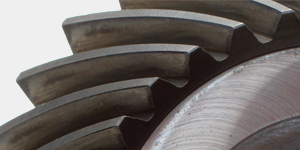 Tooth breakage is a serious damage, causing loss of drive of the gear system. It is expected to occur at the highest stress concentration in the tooth root, normally close to the 30° tangent to the toot root fillet. Macropitting is a fatigue damage where limits of the surface durability of the meshing flanks are exceeded. Particles break out of the flanks, leaving pits. For through-hardened gears, a certain level of macropitting is acceptable. 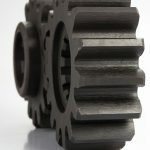 For high-performance case-carburized gears, however, even minor macropitting is not acceptable, although the gears might still be operable. Macropitting reduces the actual safety against tooth breakage, and in many cases, causes deterioration in noise and vibration behavior. Scuffing is a surface damage where seizure or welding together of areas of tooth surfaces occurs due to absence or breakdown of a lubricant film between the contacting tooth flanks of mating gears, which is caused by high temperature and high pressure. 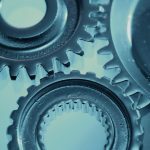 In an instant, it can significantly damage a major portion of the gear flanks and therefore needs to be strictly avoided. Tooth flank fracture is another severe kind of gear damage leading to immediate loss of drive in many cases. Tooth flank fracture is characterized by a primary fatigue crack in the region of the active contact area, initiated below the surface due to shear stresses caused by the flank contact. The primary crack propagates from the initial crack starter in both directions — toward the surface of the loaded flank and into the core toward the opposite tooth root section. Micropitting is a surface phenomenon that mainly occurs with case-carburized gears. It causes multiple microscopic particles to break out of the loaded flank surface, creating gray-appearing areas. 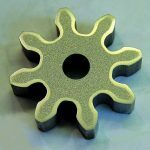 ISO TR 15144-1:2014  provides a method to determine the micropitting load capacity of cylindrical gears. 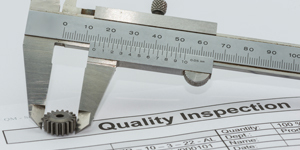 It is intended to become an ISO Standard within the next years. 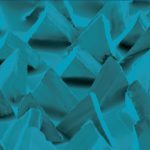 In the primary stage of micropitting, the surface wear does not create a relevant change in tooth geometry. Likewise, the surface roughness does not necessarily increase, but by smoothening of the gray area, it may as well decrease. Power transmission and noise and vibration behavior are not affected negatively, but may even improve. Therefore, though not in every case, micropitting should be considered damage, as it may arrest. However, if the abrasive wear due to micropitting does not come to a stop at an acceptable stage and after a reasonable time of operation, significant changes in lead and profile may cause transmission errors, noise and vibrations, and load concentration in other flank areas. Moreover, significant micropitting can increase the risk of severe pitting damage and even subsequent tooth breakage. 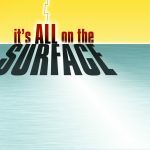 In Reference , an overview on micropitting is presented with the aim to raise the sensitivity to distinguish between harmless initial micropitting and a real surface damage. To continue the investigation in this paper, for examples presented in Reference  and additional new examples, the calculation methods as presented in Reference  are applied and resulting safety factors are discussed. 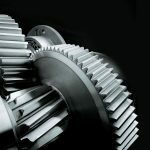 Examples are selected from the fields of high-speed gears, cement mill drives, extruder drives, and wind turbine gears. The examples are limited to the authors’ own experience and are not considered a full-scale validation of Reference . Operating conditions for some examples are out of the validated range of the Technical Report. Figure 1 shows the typical gear flank of a test gear with micropitting after running a micropitting test according to Reference . “Micropitting is a phenomenon that occurs in Hertzian type of rolling and sliding contact that operates in elasto-hydrodynamic or boundary lubrication regimes. Micropitting is influenced by operating conditions such as load, speed, sliding, temperature, surface topography, specific lubricant film thickness, and chemical composition of the lubricant. Micropitting is more commonly observed on materials with a high surface hardness. “Micropitting is the generation of numerous surface cracks. The cracks grow at a shallow angle to the surface forming micropits. The micropits are small relative to the size of the contact zone, typically of the order 10 μm−20 μm deep. 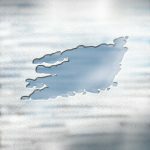 The micropits can coalesce to produce a continuous fractured surface, which appears as a dull, matte surface during unmagnified visual inspection. 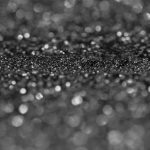 “Micropitting is the preferred name for this phenomenon, but it has also been referred to as grey staining, grey flecking, frosting, and peeling. Illustrations of micropitting can be found in ISO 10825. 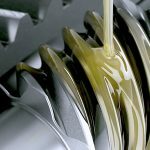 The calculation approach of ISO TR 15144-1  is based on evaluating a safety factor, Sλ, as the relation between the minimum specific lubricant thickness in tooth contact, λGF,min, and a permissible specific lubricant film thickness, λGFP. To determine the minimum permissible specific lubricant film thickness, λGFP, different methods may be applied according to Reference . 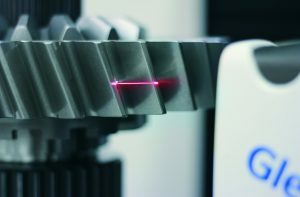 With Method A, the value of λGFP is determined based on the experience on real gears. Therefore, comparable application, manufacturing, and operating conditions need to apply to use this method. Method B describes a procedure to derive the value of λGFP from results with other gears or conditions, especially micropitting test results (as described in Reference , for example). For this value, the differences between test and application should be taken into account. The factors of Equation 5 consider the relevant influences on the lubricant film thickness, such as local radii of curvature (ρn,Y), material (GM), local velocity (UY), local load (WY), and local sliding (SGF,Y). The whole calculation is done locally for each defined point of the contact area, Y. All local factors of Equation 5 are marked with index Y. The individual influence of each factor in Equation 5 is shown in Figure 2 for an example gear with assumed load distribution. The material factor is independent from the position in the contact area, Y. The curvature and the velocity factor only depend on the position in profile direction. The parameters for load and sliding depend on the individual local conditions in the contact area with respect to load and geometry. 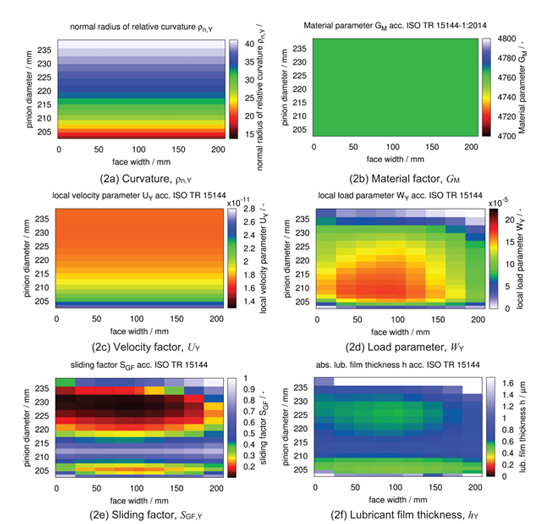 All these influence factors are superposed to a distribution of lubricant film thickness, as shown in Figure 2f. 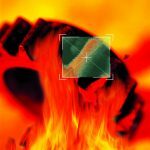 As a contribution to validate the calculation methods of Reference , practical case-carburized gear applications within the authors’ own range of experience are evaluated. Micropitting calculations according to Reference  were performed for gears where micropitting had occurred, as well as for highly loaded gears where no micropitting was observed. The load distribution was calculated as Hertzian pressure distribution by the FVA-FZG software RIKOR, following Method A of Reference . Tooth geometry and modifications as designed were used unless specifically mentioned in the examples. For the minimum permissible specific lubricant film thickness, λGFP, Method B of Reference  was used. All load factors were adopted from the individual specifications without individual validation unless specifically mentioned (especially for load distribution factor, KHβ). Variable load conditions are considered by an application factor, KA, as specified. The first example is adopted from Reference  for calculation according to Reference . It is the single helical sun pinion of the intermediate stage of a 1.5 MW wind turbine gear, loaded with a nominal Hertzian stress of 1070 N/mm². Due to undesirable misalignment exceeding the influence of the load distribution factor, KHβ, as used for the design calculations, a higher load concentration is recognized for the generator side of the gear flanks. Therefore, in several cases, micropitting could be observed mainly in the generator side root area of the sun pinion. 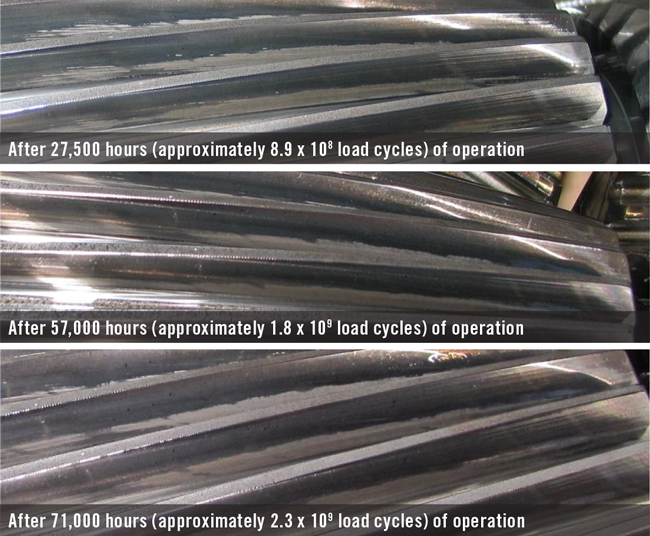 Figure 3 shows the development of this appearance after 17,800 hours (approximately 1.4 x 108 load cycles) and after 43,000 hours (approximately 3.4 x 108 load cycles). 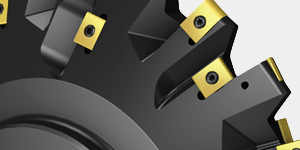 The appearance is very similar on all pinion teeth. On the left side, Figure 4 shows the distribution of Hertzian stress over the field of contact, as evaluated by RIKOR. This load distribution considers the intended design and installation condition. Based on this load distribution and other pertinent input parameters for the calculation of the micropitting safety factor, Sλ, the right diagram shows the local safety factors in the field of contact. The lowest values are slightly greater than 1.5 and in the root area in the middle of the flank. The safety factors indicate a moderate risk of micropitting, but the actual appearance of micropitting is not in the middle, but at the right end of the face width. The explanation for this discrepancy and more evidence for micropitting to occur was found in the fact that due to a misalignment condition of the complete wind turbine drive, the load distribution was not as designed, but unevenly shifted to the generator side of the tooth contact. The actual load distribution and the referring safety factors against micropitting are shown in Figure 5. The uneven load distribution causes a stress concentration on the generator side edge of the mesh and consequential decrease of the safety factor against micropitting to close to 1.0 in the area where the actual micropitting was found. Initial wear due to micropitting reduces the stress concentration in this area, and with the safety factor being low but not below 1.0, it is plausible that micropitting came to arrest. This can, however, not definitely be predicted by calculation. The second example is also adopted from Reference  for calculation according to Reference . The output (high-speed) single helical stage of a 1.5 MW wind turbine gear is loaded with a nominal Hertzian stress of 880 N/mm². After more than four years and 27,500 hours of operation (approximately 8.9 x 108 load cycles), a significant area of micropitting was found in the root area of every tooth of the output pinion. Later inspections after 57,000 hours (approximately 1.8 x 109 load cycles) and 71,000 hours (approximately 2.3 x 109 load cycles) did not reveal further development of the micropitting area. The surface apparently had smoothened. See Figure 6 for pictures taken with the different inspections. On the left side, Figure 7 shows the distribution of Hertzian stress over the field of contact, as evaluated by RIKOR. 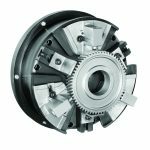 To reflect the position of the micropitting area within the given tolerances, maximum values for crowning and profile angle deviation for pinion and gear were assumed, resulting in a load concentrating in the center root area. Based on this load distribution, the right diagram shows the local safety factors for micropitting in the field of contact. The lowest values are slightly greater than 2.0 and in the root area in the middle of the flank. The safety factors indicate a moderate risk of micropitting. Additional effects, such as surface roughness, geometric deviations, or load peaks, may have caused initial micropitting. The calculated safety factors support the fact that micropitting finally arrested. The third example is also adopted from Reference  for calculation according to Reference . On the pinion shaft of a 75 MW high-speed double helical reduction gear for power generation (gas turbine to generator) with a nominal Hertzian stress of 700 N/mm², after 8,000 hours of operation (approximately 2.6 x 109 load cycles), narrow gray lines were found on the load flanks (see Figure 8). Detailed microscopic investigations confirm that these are lines of micropitting. 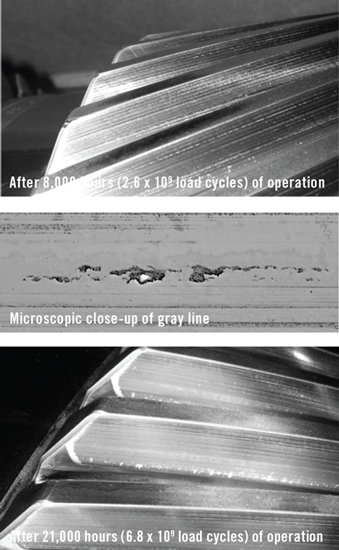 A subsequent inspection after 21,000 hours (approximately 6.8 x 109 load cycles) did not reveal further development of micropitting. The lines appear even smoother than with the previous inspection. After this number of load cycles, no further deterioration is expected. Figure 9a shows the distribution of Hertzian stress over the field of contact as evaluated by RIKOR. Based on this load distribution, the diagram on the right shows the local safety factors for micropitting in the field of contact. It needs to be mentioned that the pitch line velocity of v = 150 m/sec. is far higher than the validated range of 8 m/sec. < v < 60 m/sec., as specified in Reference . 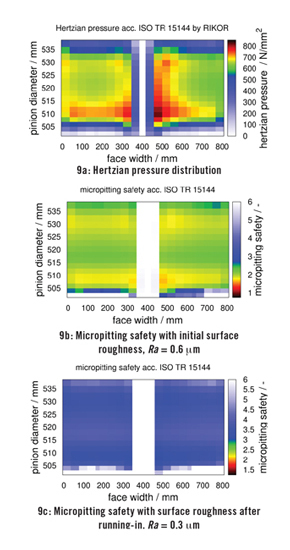 For the surface roughness after running-in, shown in Figure 9c, the lowest values for micropitting safety are greater than 3.0. This matches with the observation that after a very high number of load cycles, no significant micropitting has developed. The initial narrow lines of micropitting can be explained using the initial surface roughness for calculation, lowering the minimum safety factor to a range of slightly below 2.0 (see Figure 9b). Together with very local stress concentration in the area of the protruding grinding marks, this is a reasonable explanation for the microscopic micropitting wear. After the protruding areas are removed, load distribution and roughness turn into the condition as calculated for Figure 9c, with no remaining risk of micropitting. This single example is not considered sufficient validation to extend the range of Reference  for higher pitch line velocity but is an indication that this might be reasonable. Such extension needs to be supported by systematic research and/or more practical examples, especially for high-speed gears with significant micropitting damage. This example shows the summation stage of the power-split section of an extruder drive (see Figure 10). 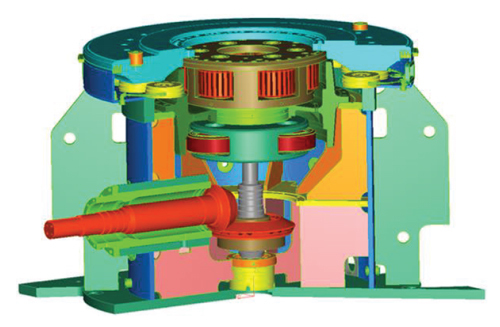 Half of the common power of the main drive and superposition drive is transmitted directly to one of the two extruder shafts. For the second extruder shaft, the power is split on two lay shafts and the power added back in the marked summation stage. This stage has a high nominal Hertzian pressure of more than 1100 N/mm² but did not — in any of the applications — show signs of micropitting after many years of operation with a number of load cycles in the long life range of the S/N curve (> 5 x 108 load cycles). Figure 11 shows the distribution of Hertzian stress over the field of contact, as evaluated by RIKOR. Based on this load distribution, the diagram on the right shows the local safety factors for micropitting in the field of contact. The minimum safety factor is slightly above 2.0. Unless additional effects occur, such as deterioration of lube oil quality, unfavorable load distribution due to misalignment, or higher surface roughness, micropitting is quite unlikely. This is confirmed by the fact that micropitting has, so far, not been observed with these gear stages. The final example shows the output sun pinion of a vertical roller mill drive (see Figure 12). This stage has a nominal Hertzian pressure of approximately 800 N/mm², with load distribution factor for six planets, Kγ, not considered. The pitch line velocity of v = 1.6 m/sec. is lower than the validated range of 8 m/sec. < v < 60 m/sec. as specified in Reference . Figure 13 shows the distribution of Hertzian stress over the field of contact, as evaluated by RIKOR. A reasonable load distribution factor for six planets, Kγ, is considered. Based on this load distribution, the diagram on the right shows the local safety factors for micropitting in the field of contact. The minimum safety factor is slightly below 3.0, i.e., micropitting is very unlikely. This is confirmed by the fact that micropitting has not been observed with many of these sun pinions in operation since 1999, which, for many parts, means more than 5 x 108 load cycles. 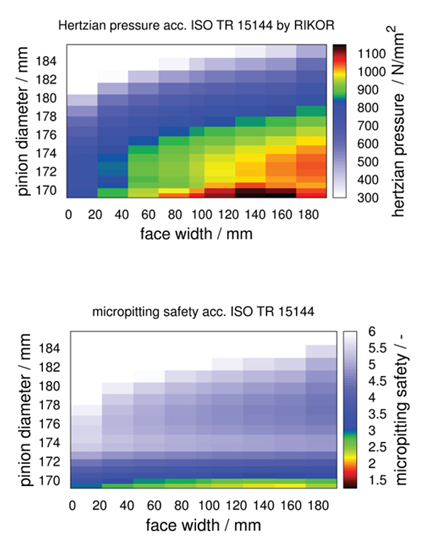 Based on these references and the evaluation of the examples presented in this paper, a recommendation for a reasonable minimum safety factor against micropitting, Sλ, is proposed, as shown in Figure 14. The examples presented in this paper are included in the diagram and confirm that the results of the calculations match well with the observations on the real gear flanks. This or a similar diagram should be added to Reference  as guidance, but more examples should be added for validation. Micropitting has sufficiently been investigated and defined to provide a sustainable basis for a calculation method. The calculation methods as described in ISO/TR 15144-1:2014  are applicable to practical gear designs, especially when the actual load distribution over the face width is accounted for appropriately. Micropitting observed on gear flanks can be explained by the calculation results. For cases with safety factors between 1.5 and 2, it is hard to predict whether micropitting will occur or not. For examples where no micropitting can be observed, sufficiently high safety factors were evaluated. Additional examples from various applications are necessary before the Technical Report becomes an ISO Standard. Pinnekamp, T. Weiss, G. Steinberger: Micropitting – a Serious Damage? Testing, Standards and Practical Experience. AGMA Fall Technical Meeting, Cincinnati, October 2011. 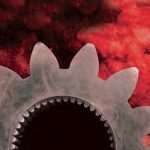 ISO/TR 15144-1:2014, Calculation of micropitting load capacity of cylindrical spur and helical gears – Part 1: Introduction and basic principles. 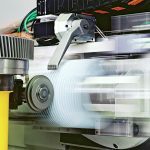 ISO 6336-2:2007, Calculation of load capacity of spur and helical gears – Part 2: Calculation of surface durability (pitting). 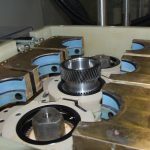 ISO 6336-3:2007, Calculation of load capacity of spur and helical gears – Part 3: Calculation of tooth bending strength. 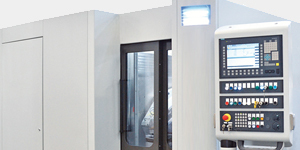 ISO TR 13989:2000, Calculation of scuffing load capacity of cylindrical, bevel and hypoid gears. ISO DTS 19042-1:2015: Calculation of tooth flank fracture load capacity of cylindrical spur and helical gears – Part 1: Introduction and basic principles (working draft). B.-R. Höhn, H. Winter, U. Schrade, S. Emmert, G. Schönnenbeck, P. Oster, H. Rettig: FVA – Information Sheet, Research Projects Nr. 54 / I–IV. D. Dowson, G.R. Higginson: Elastohydrodynamic Lubrication. Pergamon Press, Oxford, 1966. 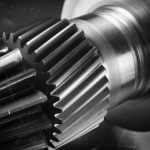 AGMA 925-A03: Effect of Lubrication on Gear Surface Distress. * Printed with permission of the copyright holder, the American Gear Manufacturers Association, 1001 N. Fairfax Street, Suite 500, Alexandria, Virginia 22314. 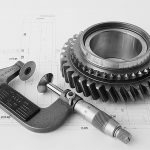 Statements presented in this paper are those of the authors and may not represent the position or opinion of the American Gear Manufacturers Association (AGMA). 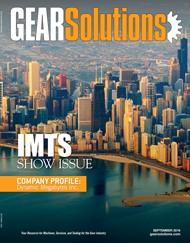 This paper was presented October 2015 at the AGMA Fall Technical Meeting in Detroit, Michigan. 15FTM26. received a degree in mechanical engineering in 2006 and a Ph.D. in 2012 at the Gear Research Center (FZG), Technical University Munich. He continued his work at FZG as team leader for gear dynamics and calculation. 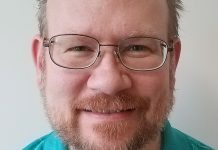 Since 2014, Heider has been a senior engineer at the Central Gear Technology division at RENK AG, Augsburg, for gear calculation, programming, and structural and dynamic analyses. 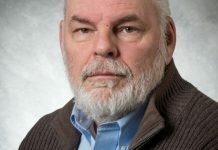 received his degree in mechanical engineering in 1987 and a Ph.D. in 1992 at the Gear Research Center (FZG), Technical University Munich. He continued his work at FZG as chief engineer in the field of continuously variable transmission and hybrid car propulsion systems. From 1996 to 1999, he was deputy chief designer with the design department for marine gears at RENK AG, Augsburg. 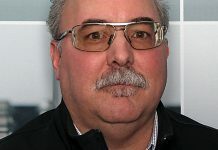 From 1999 to 2001, he was head of the design department for industrial gears, and from 2001 to 2004, he was head of the design department for high-speed gears at RENK AG, Augsburg. From 2004 to 2006, he was with RENK Corporation, USA, for various marine and industrial gear programs. 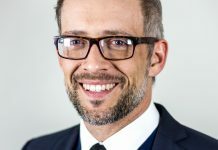 Since mid-2006, he has been the head of the Central Gear Technology division at RENK AG, Augsburg, for gear calculation, programming, structural and dynamic analyses, and innovation management.